Yesterday, I had the mood of doing nail art thus I have created this look. I know you are thinking, this nail art will take too much time !! But girls, the whole hand took less than 10 minutes. There are plenty numbers of nail arts which you can make in less than 10 minutes. How I get this nail look – read on for more. 1. Apply your usual base coat on your nails.2. Apply double coat of bright color nail paint like you can use bright yellow(what I have used), bright green, bright pink or any other bright color. Bright and dark color are most striking combo ever.3. Now, wait for few minutes to dry out your nail paint, if you are in hurry you can also low dry your nails with the help of hair blow dryer.4. Take some black stones with you, if you are not having black stones then you can use your black stones bindi as well (even I have used the same 😉 )5. Now, take a single drop of top coat and apply it on your lower part of your nail and then put a single piece of a “black stone” over it. Do this same thing to the rest of your nails.6. Now, you can take a toothpick ( or an old eyeliner brush or zero side paint brush) and a intense color black nail paint.7. Slowly, Dip the toothpick in the black nail paint and put small clear dots in the decreasing order over your nails. Now, do this same thing to the rest of your nails.8. Finish this nail art with a couple of layers of top coat. I had recommend using a thick top coat to give it a smooth texture. 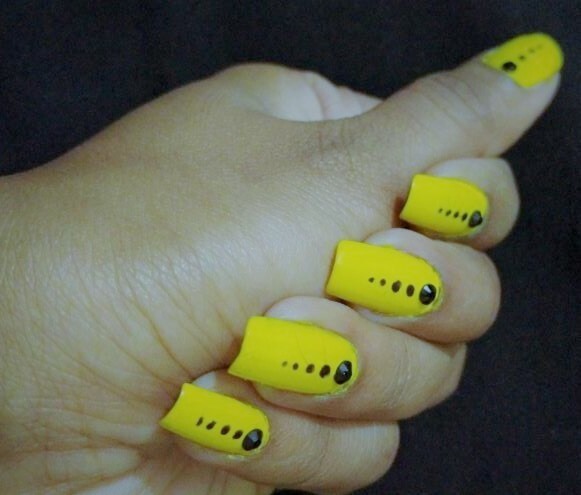 Below are some nail arts hacks.1. Always apply a clear base coat.2. Always apply double coat of bright color nail paint.3. Finish off with a few layer of top coat to give it a smooth finish.4. Try to have patience because practice makes perfect.